Old-time banjo players love to employ a variety of different banjo tunings to play songs in different keys. With each new tuning, unique combinations of open and fretted strings emerge, resulting in new sounds and playing possibilities. It’s amazing how these tunings can create different emotions and moods in both players and listeners. Using G tuning as a starting point, you put the banjo in C tuning by lowering the pitch of your 4th string the equivalent of two frets from D to C and raising the pitch of your 2nd string from B to C. Your 1st, 3rd, and 5th strings are the same in C and G tuning. Attach your electronic tuner to the banjo headstock. Turn the peg on the 4th string in a counterclockwise direction until your electronic tuner indicates that you’ve lowered the pitch the equivalent of two frets from a D to a C.
Double-check your 4th string tuning. Fret the 4th string at the 7th fret and compare the sound of this string with the open 3rd string. If both strings are in tune, your electronic tuner should indicate a G note. Tighten the 2nd string peg by moving it in a counterclockwise motion until your tuner indicates that the string is sounding a C note, a change in pitch of one fret. Double-check your 2nd string tuning. Fret the 2nd string at the 2nd fret to compare the sound of this string with the open 1st string. If both strings are in tune, your tuner should indicate a D note. As you turn each peg to retune, try striking the string with any right-hand finger to hear whether the pitch is going in the desired direction. By using your ear in addition to your electronic tuner, you refine your tuning ability, which is a very important skill in old-time banjo. When you change the tension of one string by raising or lowering its pitch, don’t be surprised to find that the adjacent strings on your banjo have now unfortunately gone out of tune. No worries. If that’s the case, simply touch up the other strings so that your 3rd and 5th strings are tuned to G and the 1st string to D.
Then double-check the 4th and 2nd strings to make sure that they’re still holding the desired pitch. For double C tuning, as well as the other tunings featured in this section, you can hear this demonstrated in “Soldier’s Joy” in Double C Tuning before the song is played. As a companion to your own ear and your electronic tuner, listening to this demo is a great way to get your banjo into the different tunings you need. You’re not cheating if you use an electronic tuner to help you retune the banjo. At an old-time jam session, almost all musicians use tuners as aids to their ears, so you can too! 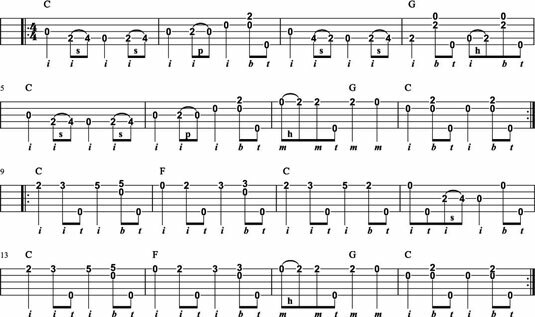 Now that you’re in double C tuning, you’re ready to play “Soldier’s Joy,” one of the oldest tunes in all old-time music — and maybe the most frequently played. As shown here, this is a straightforward arrangement that focuses on a clear presentation of the melody using basic clawhammer techniques. “Soldier’s Joy,” using double C tuning. Also, check out the video Clawhammer Banjo: Double C Tuning and “Soldier’s Joy”.